DreamHost offers an FTP client in the panel called 'WebFTP' that you can use to connect to your webserver. The instructions below describe how to use this feature in the DreamHost panel. Your site must be Fully Hosted in order to log in to it. Under your domain, click the 'WebFTP' link. This automatically logs you into the WebFTP server. The page automatically loads the directory. This returns you to the directory just above the current directory. Uploads are limited to 1GB. Log into WebFTP using the instructions in the above section. 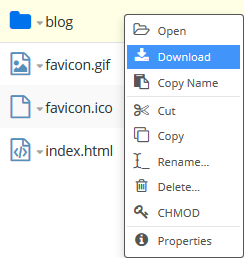 To upload files, click the upload icon on the bottom left. A pop-up window appears allowing you to locate the file/folder to upload. Downloads are limited to 1GB. This section explains how to download files or folders from the web server to your computer. In your web directory, right-click the file you wish to download. 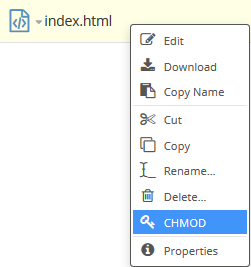 You can also click the file to highlight it, then click the download icon on the bottom toolbar. Depending on your browser, you are either prompted to confirm the download or it downloads automatically (no prompt). Folders are downloaded as .zip files. This option allows you to download a file from an external location by using the file's URL. In the bottom toolbar, click the 'Fetch' icon. Click the OK button to download the file. 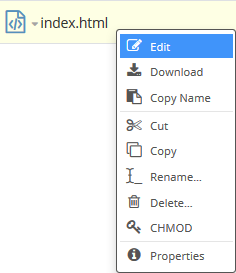 Right-click a file to open an editing options menu. In the menu, select 'Edit'. The source editor opens where you can make adjustments to your file. After you finish editing the file, click the Save button on the bottom right to save your changes. When finished, click the Close button to go back to the previous listing of files. You can create a file or folder within WebFTP. In the bottom toolbar, click the Create icon. From the menu, select either 'New File' or 'New Folder'. A pop-up displays where you can name the new file or new folder. 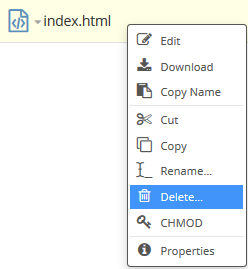 Enter a name for the file or folder, and then click theOK button to save it. If you are creating a file, the file editor opens where you can add content to the file. 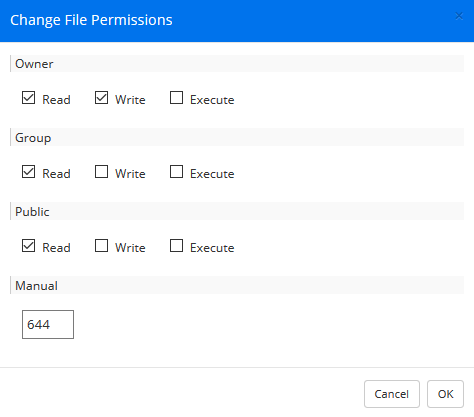 You can change the permissions on a file or folder within WebFTP. From the menu, select 'CHMOD'. In the pop-up, adjust the permissions as needed. You can also type in the number value for the permissions. From the pop-up window, select 'Delete'. Article last updated April 11, 2019 17:21 PST.